NEW YORK, Jan 20, 2011 / FW/ — Now considered a mainstay at the “tents”, American Express returns to Lincoln Center for Mercedes-Benz Fashion Week Fall 2011 season with an enhanced industry access for its fashion-savvy cardmembers. 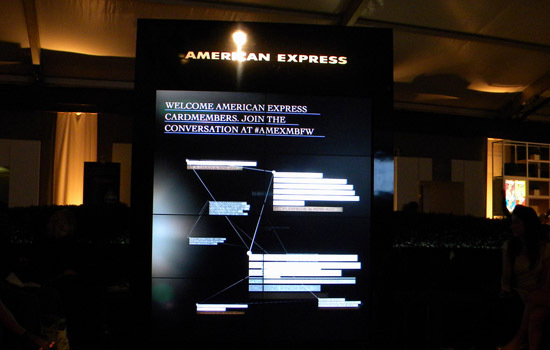 For the 8th consecutive season, American Express has sponsored the “American Express Skybox” which provides unique access to some of the industry’s boldest and most successful names. Starting today, American Express Cardmembers can purchase packages at www.americanexpress.com/entertainment to experience firsthand an array of unforgettable fashion moments. Once again providing an unprecedented vantage point of the runways at Lincoln Center, the exclusive American Express Skybox serves as a sleek, chic hideaway to elevated fashion experiences. Between shows, stylish Cardmembers can join Skybox Host Kate Nobelius and mingle with a who’s who in the industry, while gaining expert tips and insights from some of fashion’s leading voices. For the first time ever, American Express will also connect fashion lovers everywhere with access to all of this season’s best Skybox moments through an innovative and engaging multimedia experience. The American Express Skybox Report will offer unique insights into what’s happening in and around the tents at Lincoln Center from the exclusive lounge high above the runway, with authentic content that offers an inside-look at some of fashion’s biggest names. Starting on February 10, visit www.amexskyboxreport.com to check out all of the exciting features of the American Express Skybox Report, and join the conversation now by following @americanexpress on Twitter and using hashtag #amexfashion. Additionally, the coveted American Express Skybox under the tents at Lincoln Center will feature an innovative digital fashion gallery of memorable moments throughout the years from the CFDA/Vogue Fashion Fund (CVFF). The unique photo installation will display an array of runway looks from past CVFF winners and finalists, illuminating American Express’s long-term commitment to supporting emerging designers and the overall fashion industry. All proceeds from the sale of Skybox packages will be donated to the CVFF, a program of the Council of Fashion Designers of America (CFDA).